It can wake you up by tapping you on your wrist using your Watch's haptic engine. You can set it to wake you if you are in light or medium sleep either 15 or 30 minutes before your set alarm time. This helps you feel more refreshed. 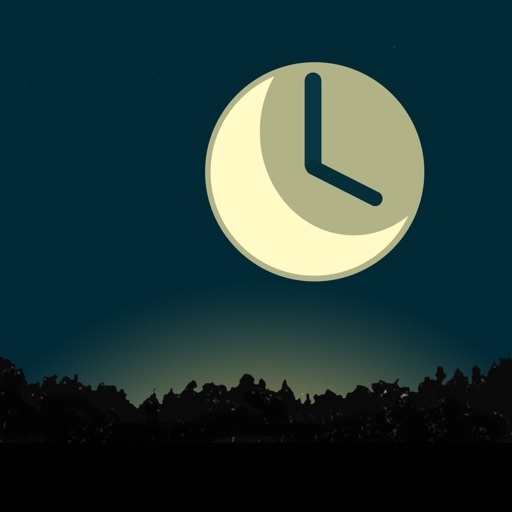 There's an optional sleep cycle buster that you can turn on to give you a light tap at 5 minute intervals in a 15 or 30 minute window before your alarm to take you gently out of deeper sleep. Not only that but it will even automatically measure your waking pulse just before the alarm sounds, which is a valuable measurement of recovery. If you ignore the alarm on the Watch, you can also set a safety alarm that will play on your phone. This will speak and/or play a chosen song from your music library. There's daily bedtime reminders and auto scheduled alarms in case you forget to set your alarm before bed. 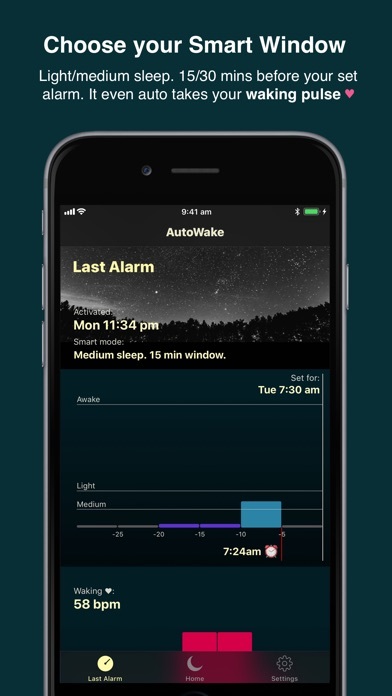 If you also use AutoSleep our auto sleep tracker, when you turn on your alarm, it can automatically tell AutoSleep that you have gone to bed so that time to fall asleep can be tracked. Your AutoSleep 7 day trailing sleep average also appears in your bedtime reminder. 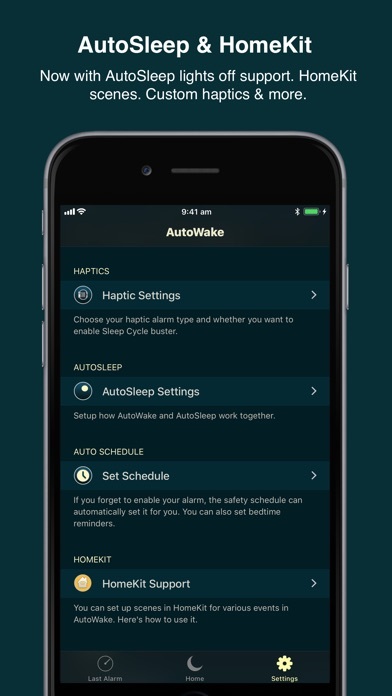 If you use Apple HomeKit then you can run scenes for key events in AutoWake like turning off your bedside lamp and setting your room temperature for sleep. 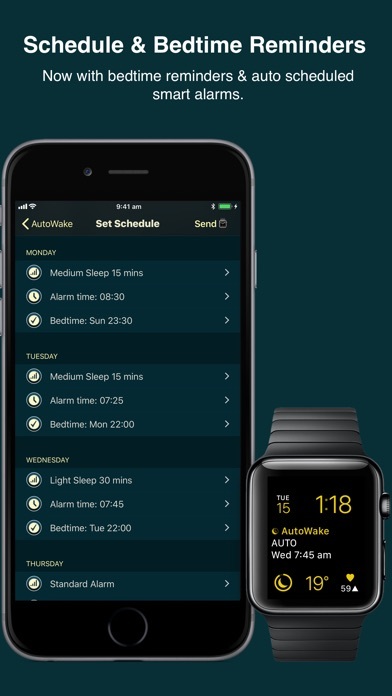 AutoWake requires an Apple Watch running WatchOS 3.2 or higher (WatchOS 4.3 (much) preferred). 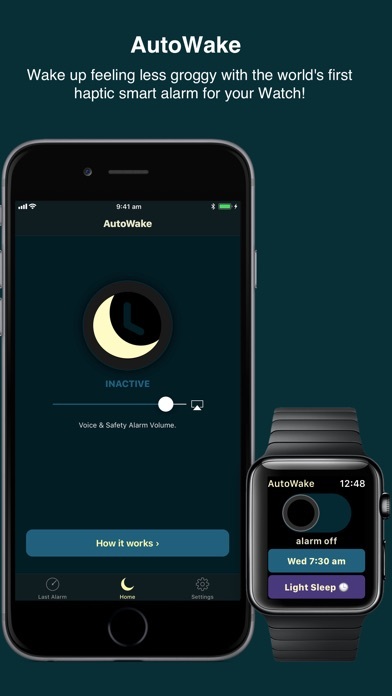 AutoWake works fine with Do Not Disturb and Theatre/Cinema mode. 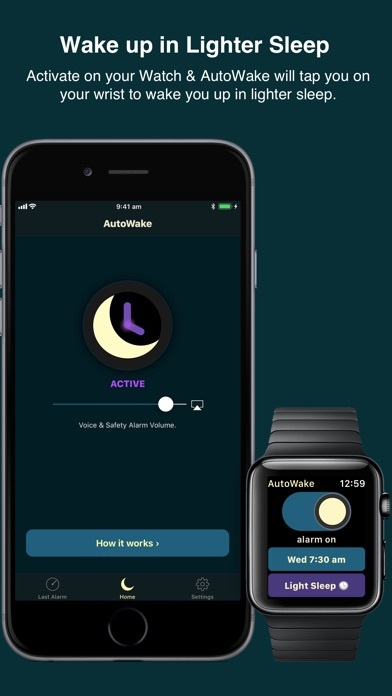 AutoWake requires at least a bluetooth connection between your iPhone and your Apple Watch during the time that you are asleep. You can use Flight Mode on your iPhone, but make sure that you turn on bluetooth. Update for iOS 12, WatchOS 5. Support for the new Watch 4 complications and screen sizes.